Are you interested in joining Urban Missions? Thanks for visiting this webpage to learn more about Urban Mission teams. Urban Missions has weekly student-led service experiences. Each team partners with a Waco orgainization, church or non-profit, to learn and serve and enjoy community at the same time and place each week. Below you see a list of teams and what day and time they serve. This is helpful in narroring down which opportunities fit your schedule. On the webpages (navigation columns on the left (web) or top right corner (mobile)) you will see further descriptions of each team. It is very important to e-mail the student leader prior to serving so that you can find out if there is any paperwork that needs to be completed first. 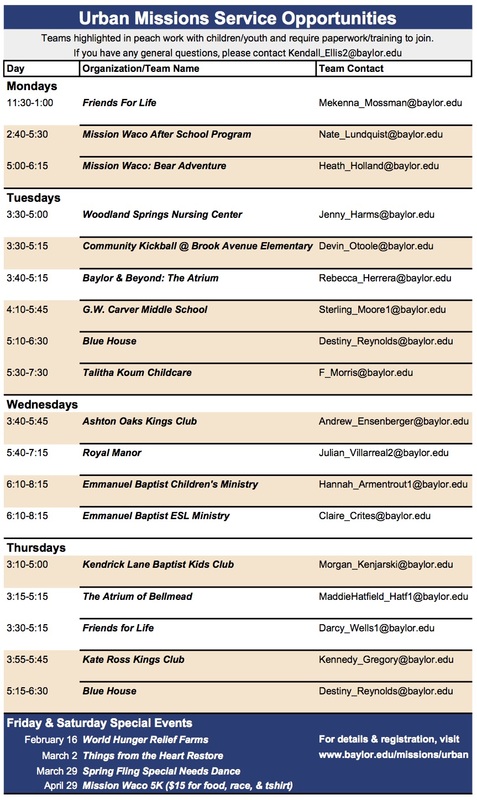 If you have any questions, e-mail Kendall Ellis, Ministry Associate for Local Ministries.